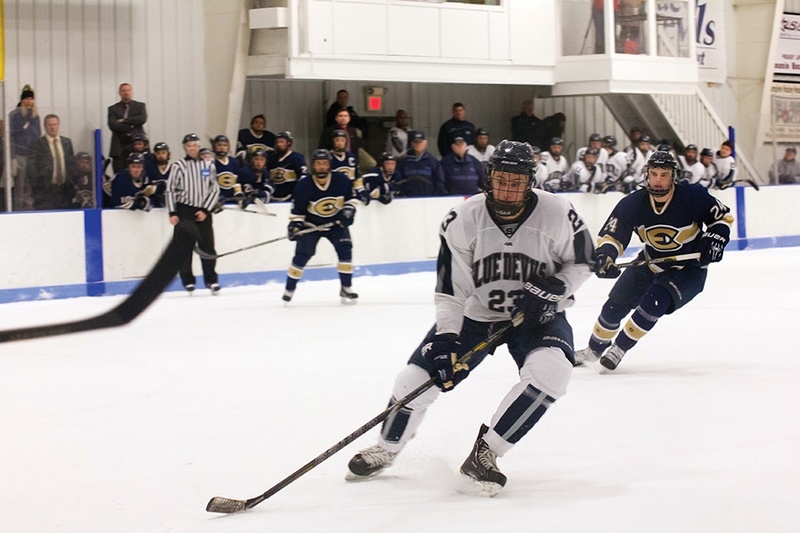 University of Wisconsin–Stout’s men’s hockey team hosted the University of Wisconsin–Eau Claire Blugolds Friday Jan. 31 and Saturday, Feb. 1 at the Dunn County Ice Center. Unfortunately for the Blue Devils, both games ended victoriously for the Blugolds. During Friday’s game University of Wisconsin–Eau Claire scored twice in the first period and each period after, taking a 4-0 shutout win over UW–Stout. Blugolds’ Ross Andersen scored a goal just under three minutes into the game, followed shortly by Jon Waggoner. Although UW–Stout outshot Eau Claire in the second period, it yielded no results. Penalties began to bog down the game during the second period with both teams taking four penalties each. In the conclusion of the second period, Andersen scored again, holding the score at 3-0. The Blugolds received a power play six minutes into the third period, resulting in a score from Patrick Moore, concluding the game. UW–Stout’s Corey Koop a freshman from Squamish, British Colombia, took the loss, giving up three goals but making 11 saves. Chase Hollander a freshman from Random Lake, Wis. replaced Koop in the middle of the second period, making 17 saves. The third period power play goal was the first goal Hollander had given up all year. On Saturday, the two teams returned to the Dunn County Ice Center with the Blue Devil’s hungry for victory. They were able to prevent a shutout, but they still fell to the Blugolds, 3-1. Blugold David Donnellan scored a power play late in the first period and another power play was successfully completed as the second period began, giving the Blugolds a 2-0 lead. UW–Stout was whistled for a penalty, and BluGold Niko Kapetanovic scored again. The Eau Claire Blugolds, ranked seventh led 3-0 in the second period. With 13:27 left in the period, the Blue Devils made it on the scoreboard with a power play goal shot by Jordan Tedinnick a junior from Onalaska and assisted by senior Kevin O’Donnell from Stoughton, Wis. and junior Matt Millis from Black River Falls, Wis. That was the last goal made by either team, ending in a 3-1 loss for UW–Stout. Chase Hollander started in his first collegiate game in the goal, making 25 saves. The men’s hockey team will return to the Dunn County Ice Center to host University of Wisconsin–Stevens Point on Friday, Feb. 7 and Saturday, Feb. 8. Both games begin at 7:30 p.m.